18th December 2016 Winter Solstice. 20th December 2015 Winter Solstice. 19th December 2014 Winter Solstice. 21st December 2013 Winter Solstice. 18th December 2011 Winter Solstice. 22nd December 2010 Winter Solstice. 19th December 2010 Winter Solstice. 18th December 2010 Winter Solstice. 22nd December 2009 Winter Solstice. 21st December 2009 Winter Solstice. 21st December 2008 Winter Solstice. 21st December 2007 Winter Solstice. 22nd December 2006 Winter Solstice. 21st December 2006 Winter Solstice. 21st December 2005 Winter Solstice. 20th December 2005 Winter Solstice. 21st December 2004 Winter Solstice. 19th December 2004 Winter Solstice. 21st December 2003 Winter Solstice. 22nd December 2002 Winter Solstice. 21st December 2001 Winter Solstice. Alan Betson has created a selection of his best Winter Solstice photographs which are now available to purchase. 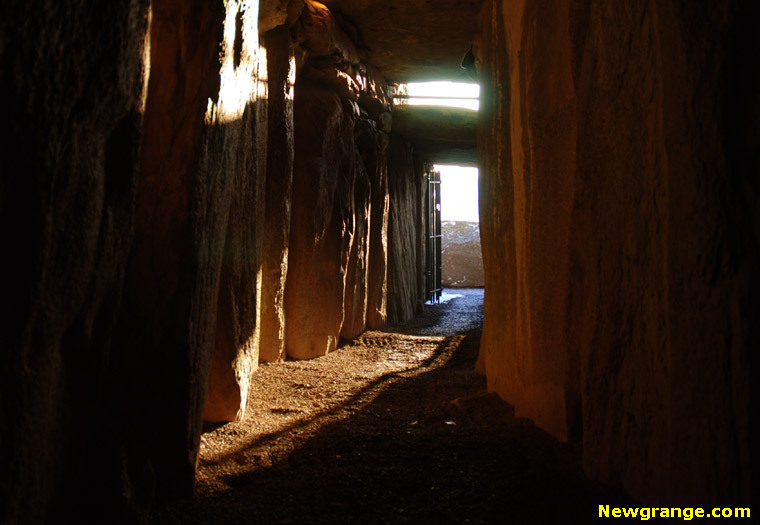 It was new age technology combined with 5,000-year-old Stone-Age engineering. 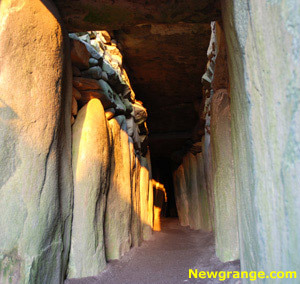 Yesterday, for the first time, the winter sun lighting the passage tomb at Newgrange, Co Meath, was beamed live around the world on television and the internet. Hundreds of people travelled long distances to face the sun as it rose over the Boyne Valley, as locals had done thousands of years earlier. The morning frost may have chilled fingers, but it provided perfect crisp weather for viewing the winter solstice. Witnessed by just a select few inside the snug burial chamber, the annual event was transmitted live by the Office of Public Works to hundreds of thousands of people via internet and television stations, including TV3. It was 40 years ago that Helen Watanabe-O'Kelly first witnessed the event alongside her father, Professor Michael J O'Kelly, who rediscovered the winter solstice phenomenon when he unearthed the roof box. Yesterday saw his daughers -- Helen, Eve and Ann -- return to the chamber as part of the select group of dignitaries and lottery winners to celebrate the 40th anniversary of Professor O'Kelly's remarkable discovery. "It was extraordinary, I remember seeing it in around 1969 -- all alone, just me and him. No cameras, no lights, nothing. The whole place was just illuminated. I'll never forget it," Ms Watanabe-O'Kelly said. "He was the first person in about 5,000 years to see it." Outside, incense burned as some watchers saluted the rising sun, others simply watched while the sun set the roof box aglow. 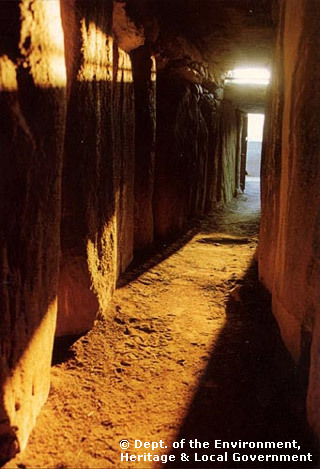 On a massive screen outside the passage tomb, from just before 9am the beam of amber light could be seen creeping along the floor. Inside in the small chamber was Environment Minister John Gormley, Minister of State Noel Ahern, and a lucky few whose names had been drawn out of a lottery of over 29,000 people for the golden tickets. Mr Gormley, who was dashing off to see his son in a nativity play, said: "It was a real privilege and a once in a lifetime experience." Also present was a rather chilled Professor John Patrick O'Grady, from the University of Sydney, who surveyed the ancient astronomical observatory as part of his PhD Thesis work. 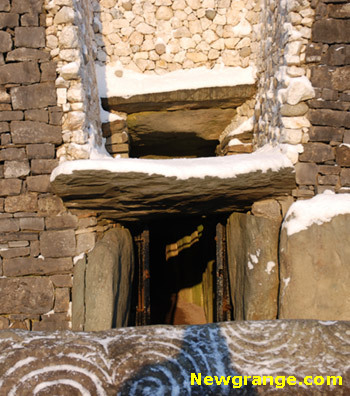 Prof O'Grady chose the 40th anniversary to donate his papers on the passage tomb to the State. "The first time we saw it was a very emotional experience, it is a cultural confirmation of a culture so old," he said. Elizabeth Murray, Deputy Principal from St Mary's Primary School in nearby Trim, had witnessed the event from within the chamber and vowed to bring back a small squadron of pupils to see it. "They are learning about it in school and I thought it would be a good experience," she said. Other years, protestors had gathered outside in objection to the construction of the M3 motorway close to the historic Hill of Tara, yesterday there were no banners but still many supporters of the 'Save Tara' campaign were present. After venturing along the treacherously icy roads from Co Wicklow, biker, Brian McGuinness, sat soaking up the winter sun outside the chamber. "The huge crowd was nice to see. Maybe there is a change going on after the few years of madness that was the Celtic Tiger," he said. Solstice regular, Cliodhna Ryan (33) from Carlingford, Co Louth said the television cameras had impinged upon the "moment of silence and quiet" as the sun rises. After travelling from Chicago, James Robeson (64), quipped: "It might convert me from being a Roman Catholic to becoming a druid."